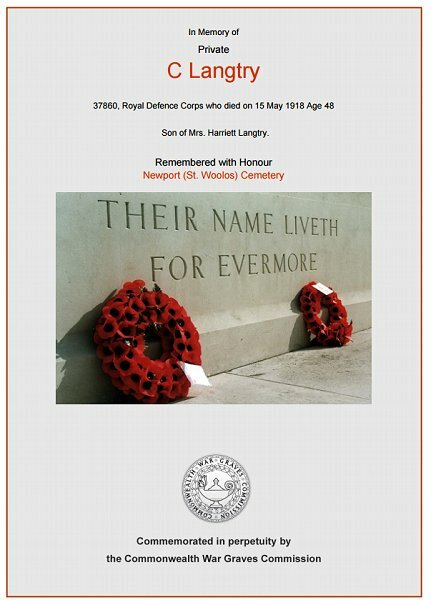 Charles Langtry was born in Yeovil in 1870, the son of railway porter Albert Langtry (b1842, Shrewton, Wilts) and Harriet née Sweet (b1845, Bulford, Wilts). In the 1871 census Albert, Harriet and baby Charles were living at Sherborne Road, close to Pen Mill Station. In 1875 a daughter, Florence, was born in Yeovil before the family left to live in Trowbridge. The Royal Hospital Chelsea Pensioner Soldier Service Records show that Charles enlisted in the army when he was aged 19 in 1889. He enlisted in the Wiltshire Regiment and his Service Number was 6601/RGA although it is not known if Charles was in the 1st or 2nd Battalion. The Wiltshire Regiment was a line infantry regiment of the British Army, formed in 1881 under the Childers Reforms by the amalgamation of the 62nd (Wiltshire) Regiment of Foot and the 99th Duke of Edinburgh's (Lanarkshire) Regiment of Foot. The Regiment rotated through various posts of the British Empire. In 1899, the 1st Wilts were stationed in India, while the 2nd Wilts were on Guernsey. This changed in 1899 when the 2nd Wilts were dispatched to South Africa to take part in the Second Boer War. After the Army Enlistment Act (1870) the normal period of service was reduced from 21 years to 12 years, so Charles could have left the army in 1901 at the age of 31. However he appears to have re-enlisted. Although I couldn't find him in the 1901 census, he was listed in the 1911 census as a 41-year old unmarried Gunner in barracks at No 4 Depot, Royal Garrison Artillery at Great Yarmouth, Norfolk. It is not known how long Charles served here but he most likely transferred to the Royal Defence Corps when it was created in 1916. His Service Number was 37860. The Royal Defence Corps was a corps of the British Army formed in March 1916 and disbanded in 1936. It was initially formed by converting the (Home Service) Garrison battalions of line infantry regiments. Garrison battalions were composed of soldiers either too old or medically unfit for active front-line service; the Home Service status indicated they were unable to be transferred overseas. Eighteen battalions were converted in this way. The role of the corps was to provide troops for security and guard duties inside the United Kingdom; guarding important locations such as ports or bridges. It also provided independent companies for guarding prisoner-of-war camps. The corps was never intended to be employed on overseas service. The circumstances of Charles' death are unknown, but he died on 15 May 1918 at the 3rd Western General Hospital, Albany Road, Cardiff, Wales. He was aged 48 and gave his sister Florence as his next of kin. The 3rd Western General Hospital, in Cardiff, was situated in a number of public buildings within the city - mainly schools. Albany Road 'Hospital' was actually a primary school in the city, which is still there and still used as a school. Charles was buried at St Woolos' cemetery, Newport, Wales. His name was added to the War Memorial in the Borough in 2018. The Commonwealth War Graves Commission certificate in memory of Charles Langtry. 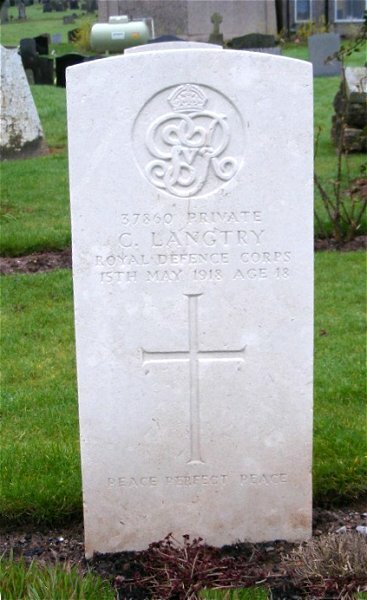 Charles Langtry's Commonwealth War Graves Commission headstone at St Woolos' cemetery, Newport, Wales.